Preheat the oven to 180°C then grease and line two 20cm round sandwich tins with baking paper. Fold in the flour and baking powder until combined. Gently stir in the milk. Divide the cake mixture between the tins. Bake for about 25-30 minutes or until the cakes have risen and come away from the sides of the tin. Once the cakes are done, remove from the oven and allow to cool completely. Spread buttercream between both cakes to stick together. Spread chilled buttercream around the cakes and smooth out. Return to the fridge until you are ready to add the glaze. Prepare Cake Angels Glossy Mirror Glaze. 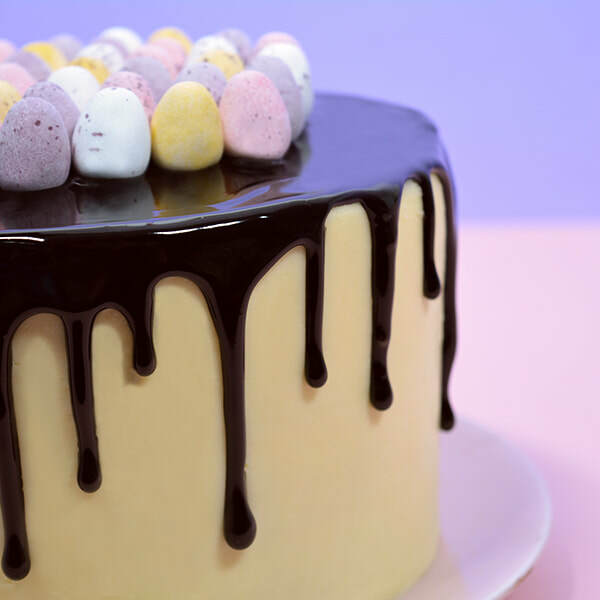 To create a drip effect, use a spoon to apply the glaze around the edges of your cake. Slowly let the glaze drip onto the cake and down the sides, then add more glaze to cover the top of the cake. Make sure you don’t add too much as you don’t want more of the glaze to run down the sides of your cake. Add Mini Eggs to decorate.